1 package egg noodles, prepared according to package. In crock pot, place chopped onion and garlic. Layer beef on top of the onions. In a small bowl, mix the flour, worcestershire sauce, beef stock and milk. Pour over beef. Add oregano, salt and pepper. Cook on low 6 hours, stirring occasionally. While waiting for pasta to cook, chop mushrooms and add to the beef. Stir in sour cream and red wine vinegar. Put crock pot on high while pasta finishes up. Drain pasta, serve beef over pasta. This is one of those dishes I created in my head by staring really hard at my pantry. I found a can of Organic Butternut Squash Puree left over from the days when my twins were eating purees. I made 99.9% of their purees from scratch, but I had a few cans on hand for if I got in a pinch. I was on a mission to use this puree in a yummy adult meal. I succeeded big time! The sauce, while almost fat free was so good, that my husband thought it had 1/2 a stick of butter in it! There was more stuffing than the 12 raviolis, so I made a couple for my toddlers and they loved them too! In a small skillet, sautè onion and garlic. Add ground turkey. Stir, breaking up the turkey until it is almost cooked through. Add all spices. Add squash puree. Check seasonings and adjust as necessary. Remove from heat and allow to cool completely! To make sacue, pour chicken broth in a small pot. Add flour, tarragon and salt. Whisk until there are no lumps. Bring sauce to a boil, whisking occasionally until it thickens. Lay out 12 wonton wrappers. Place 1 tablespoon of turkey mixture in the middle of each wrapper. Wet the edges and fold in half. Press carefully and make sure to remove all the air. In a large pot, bring water to boil. Salt the water. Working in batches to not crowd your pot, gently lower wontons in boiling water. Cook about 3-4 minutes or until wontons float to the surface and start to turn translucent. Plate the ravioli and spoon sauce on top. 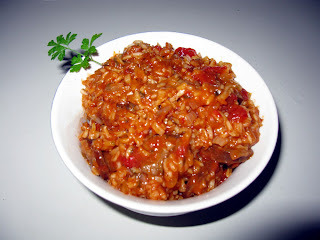 My easy Jambalaya. This is probably as authentic as Rolex bought from a New York street corner. But then again, what makes authentic cuisine? Good food, is good food and easy good food sometimes is even better. A real jambalaya might take all day to make. This took about 15 minutes to throw together. This recipe serves 2. Dice onion, bell pepper and garlic and sautè in skillet until translucent. Add sausage and cook until it starts to caramelize. In a small bowl whisk flour and chicken broth. Add tomato paste to skillet and cook it for a minute having chicken broth ready to pour in the skillet. When tomato paste has cooked through, add the broth before it burns. Add frozen okra and shrimp. Season with Cajun seasoning and oregano, salt and pepper. Serves over rice. Serves 2. These turned out delicious! Even my 16 month toddlers gobbled up the chicken and mushrooms. Since they don't have any back teeth they couldn't eat the bell pepper or onion. Cube chicken into 1" pieces. Cut bell pepper into small squares. Quarter onion. Clean 12 mushrooms. In a small bowl mix the ingredients for the glaze. Layer vegetables and meat on skewers. With a pastry brush, brush glaze onto kabobs. Marinate 1 hr, brushing glaze and rotating kabobs every 15 minutes. Grill on outdoor grill for 15 minutes or broil in oven. Serves 2. Chicken 1 pt per oz. I honestly don't remember where I picked up this recipe for Weight Watchers Mexcian Casserole. I think it might have been on one of those cards you get when you attend meetings. I'm not sure, I just know that I've made it several times, it's always a big hit and it is only 5 pts for a serving. Somewhere along the line I added a can of tomatoes to the dish because it was too dry. Well tonight I forgot to *drain the tomatoes and it became too wet. Oh well, it still tasted good, but instead of eating it with a fork, a spoon was needed! This is SUCH an easy dinner. I call it "dump" style. Defrost chicken. Add to a big bowl. Open all cans, drain as needed and pour in the bowl. Add seasonings, including salt and pepper if desired. Add almost all the cheese, reserving some for the top. Mix chicken and all ingredients very well. Layer 1/3 of tortillas in the bottom of a casserole dish. Layer 1/2 of chicken mixture. Layer 1/3 of tortillas, and the rest of the chicken mixture. Top with the last of the tortillas and sprinkle with set aside cheese. Bake at 350º for about 30 minutes. Serves 12. Tonight for my monthly PAMOM (Plano Area Mom's of Multiples) meeting is a pot luck dinner. Everyone is encouraged to bring a favorite dish. I of course, have to be daring and bring something I've never cooked before. Anyone who knows me, knows that I tend to do this. When cooking for company, I rarely go for tried and true. I go for bold and new. It adds a level of excitement and stress to any entertaining event I do. One dish I made for company a few years ago that got big raves was Chicken and 40 Cloves (of garlic.) This really wouldn't work in this potluck, since serving a whole chicken breast to the 80 or so women would be financially unrealistic. So, I decided to try it with chicken wings and drummettes. Trim each chicken wing. Chop off the wing tip (save to make stock or discard.) Cut between the wing and the drummette. Each wing yields two pieces of chicken. In a lasagna pan place all the chicken pieces. Drizzle with olive oil. Mix in peepled garlic cloves. Add salt and pepper. Toss to coat the wings with oil. Tuck pieces of rosemary in and about the chicken. Cover and bake at 350º for 40-45 minutes. With tongs, place each piece of chicken on a cookie sheet in a single layer with space around each wing. Turn your broiler on Hi and broil for 10 -12 minutes or until the skin gets crispy and golden. Take reserved garlic that is now roasted, about a tablespoon of the cooked rosemary and 1/2 cup of pan drippings. Blend in together in a blender. Place chicken in a big mixing bowl, pour garlic puree on top and coat the chicken. Serve warm. Fast and Easy was what I needed for tonight. This fit the bill with the plus side of being super yummy! I got this from a Weight Watchers Stir It Up! Super Skillet Cookbook. I made the recipe to serve 2 instead of four and figured out my own points. In a cast iron skillet (or other heavy skillet) sautè onions and bell peppers. Remove from skillet. Add chicken, salt & pepper, thyme and worcestershire sauce. When chicken is almost cooked through, add back veggies and cook the chicken through. Spoon half onto each loaf that is cut down the middle. Add 2oz cheese to each sandwich. Broil in oven until cheese is melted. Updated 3/14/11- I no longer believe in the low fat/ high fiber lifestyle. But this recipe will still be a great meal. I'll saute the veggies and chicken in bacon grease or coconut oil and add a bunch more raw-milk cheddar cheese on top. Ideally I'd serve on a sprouted grain bread to make this a Weston A. Price approved meal! I just made this for the twins today. It was inspired by leftover turkey from Easter dinner. They loved it. Sorry no picture, they ate it too fast. Mince turkey meat. Scoop out 1/2 of an avocado into a bowl and smash with a fork. Add mayo and mix together. Add turkey meat. Spread on bread. Cut into bite size pieces and serve to nearest toddler. I went to Sam's the other day, a wholesale market, where you get everything in bulk. I bought a huge bag of frozen chicken and a huge bag of fresh broccoli. When I was thinking of what to fix for dinner tonight I knew it would involve broccoli, so it wouldn't go bad. Paired with chicken, this dish became a logical choice. Not to mention it is relatively easy and fast to make. Dice chicken into bite size pieces. Slice carrots into thin discs. Prep broccoli to have mostly florets. In a small bowl, mix all the ingredients for the sauce. Whisk until there are no flour clumps. Heat large skillet or wok to very hot. Add carrots, sautè for 2 minutes. Add chicken and broccoli. Keep stirring until chicken is almost cooked through. Add sauce. Continue cooking until sauce thickens, about 3 minutes. Serve with white rice. I guess every meal cannot be a winner. Actually this dish tastes really good if you like eggplant. John and I decided we just don't like eggplant unless it's deep fried. Which sort of defeats the purpose of eating eggplant. Actually, my two toddlers ate more of this dish than we did! They loved it. Anyway, if you want a super healthy, low calorie meal; this is a good choice. It's no secret that people who do Weight Watchers use Fiber One cereal in just about anything they can to add fiber and lower the points. I tried it here for the breading of the eggplant, and it really tasted fine. Cut both ends off eggplant. (I didn't peel it for more nutrition, but I think it would have been better that way, it's up to you to decide.) Cut eggplant length wise into 6 pieces (about 1/4 inch thick.) Grind Fiber One cereal in a blender until it is almost a powder. Pour in a shallow bowl and add seasonings. Beat 3 egg whites into a bowl. (If you have a cat or dog, give them one or two of the raw egg yolks, it's great for their coat.) Dredge your eggplant in the egg whites and then in the cereal. Spread eggplant on a cookie sheet and bake at 400º for 20 minutes. Flip them and bake an additional 20 minutes. Spray an 8x8 baking dish. Coat the bottom with a small amount of the spaghetti sauce. Layer eggplant, cheese, roasted red bell pepper & sauce. Make 3 layers and end with the cheese. Bake an additional 15 minutes or until cheese melts. Serves 4. Tonight for dinner, John had some leftovers he wanted to eat, so I wanted to make a simple dinner for myself. So, I made a Mexican dish called Huevos Rancheros. I thought I was just making up my own version, but according to Wikipedia, I pretty much hit it right on! As I was eating it, I thought of a couple of variations that would be delicious. Adding roasted corn, or avacodo for instance. I know a lot of people put refried beans, I think this would have helped make the meal more substantial for a dinner. Something to think about for next time. In a cast iron (or heavy skillet) sautè onions and bell peppers on very high heat until they start to carmalize. Salt them as they are cooking. In a toaster oven (or your regular oven) broil tortillas until crispy. Place onions and bell peppers on your tortillas. Clean out skillet and fry eggs using cooking spray so they don't stick. Keep the yolks runny as this is delicious as it runs over the tortilla! Place eggs ontop of onions and peppers. Sprinkle with cheese and top with salsa. Yesterday, I got the craving for the Chicken Lettuce Wraps that P.F. Chang (or Pei Wei) makes. There is something about the flavor profile that just has you eating more and more. So, I created some Chicken Lettuce Wraps out of the ingredients I already had in my pantry and refrigerator. Like I said, I had the PF Chang Wraps in mind when I made this, but this is not meant to be a "copy" recipe. This is what I created with the PF Chang wraps as an inspiration point. This recipe isn't for the beginner cook, as I didn't measure anything as I was creating. Sorry! But here is a basic list of ingredients. In order to keep it on the lighter side, I used half vegetables and half chicken. Mince your chicken breasts. If you start with partially frozen chicken breasts, you will find it much easier to mince. You want everything in this recipe to be a basic uniform size and as small as possible. Chop all of your vegetables and set them aside. Prepare cooking sauce, set aside. In a wok or large skillet, sautè chicken after applying cooking spray. When chicken is about half way cooked, add all the veggies at once. Stir and continue cooking on high heat. Pour over cooking sauce and cook for an additional couple of minutes. Stirring continuously. Spoon some of the filling in an ice berg lettuce leaf. Drizzle on the dipping sauce. Fold over and enjoy! Is it lunch or is it dessert? Either way, it is kid approved! I grew up on Peanut Butter and Banana Sandwiches and was thrilled to pass on this delicious-ness to my kids. A tablespoon of honey makes it that much sweetier. If you really want to take it to the next level (and push it to the dessert category) grill it with butter on a griddle, like you would a grilled cheese sandwich. Then drizzle chocolate syrup over the top. I don't think it can get any better. In a large skillet drizzle olive oil to coat pan. If using bacon pieces, don't add them yet, but if you are using uncooked bacon, cook the bacon and then remove from skillet and crumble. Add diced onion and garlic and sautè until onion gets translucent, medium high heat. Add green beans, tomatoes and reserved bacon. Add up to 1/2 cup of chicken stock. Last season with oregano, salt and pepper. Simmer for at least 30 minutes with lid off. Serves 6-8. I asked my husband for a new dinner idea, and one of the things that popped out of his mouth was jambalaya. Knowing that our freezer was stocked with sausage, that sounded like a fine proposition. So after a little research and a little tinkering, this is what I devised. Most jambalayas include shrimp, but since we didn’t have any, I omitted it and we didn’t miss it at all. Feel free to add shrimp, or even chicken, if you like contrast in your protein. It’s a quick, one pot meal that will definitely go into the dinner rotation around here. In a soup pot or Dutch oven, sauté sausage and onion until sausage is cooked through. Add stock, water, tomatoes, tomato sauce, rice, and spices. Simmer for 30 minutes, or until liquid is mostly absorbed and rice is fully cooked. By no means is this an authentic curry. Unless I just go super lucky and stumbled upon an authentic recipe by accident. Although my husband assures me that it isn't anything like the curries he's had in England. It does use a curry blend, so therefore, it is my curry. Feel free to substitute chicken for the shrimp, I've made it that way too. I cannot think of a better name for this. It's basically a homemade Hamburger Helper, or perhaps a Rice-a-Roni. I'm not sure since I never buy boxed meals. I used to eat them when I was a kid and had a few favorites that I like to recreate as an adult. This is a very family friendly meal, I'm not sure I'd serve it for company though! Oh, and please, if anyone has a better title for this meal, let me know! Preheat a skillet to medium high heat. Dice onion and bell pepper. Spray with cooking spray and put the onion and bell pepper in the skillet. While that is starting to sautè mince garlic and quarter mushrooms. Add hamburger meat to skillet. With your spoon, break the hamburger meat up and brown it stirring it for a few minutes. Add seasonings: thyme, salt & pepper. Stir in garlic and mushrooms. Let the mushrooms cook for a few minutes. In a small bowl mix beef broth with your thickner (cornstarch or flour). Stir until the thickner dissolves into the broth. Add your cooked rice to the beef mixture. Pour broth over and stir. Bring to a boil and then lower to a simmer. Simmer for an additional 5 minutes on low.